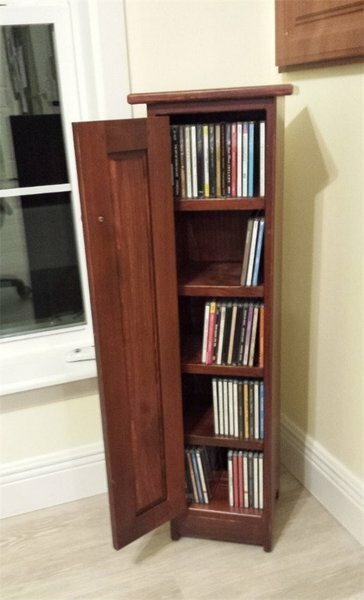 Organizing your music selections is easy with our Amish Pine CD Cabinet. With a rustic look, this charming pine cabinet complements your cottage pine furniture or rustic pine furniture easily. This compact pine cabinet fits easily into your living room, family room, den, office or bedroom. Avoid coffee table clutter and unsightly stacks with this pine CD cabinet that will keep your favorite tunes easily accessible. Hello Natalie. We just wanted to tell you that the 2 CD cabinets and the Pie Safe are just prefect. We are really happy with them. We were surprised to receive them so soon. It turned out that we didn’t need the extra shelf because the pie safe is deep enough to hold regular notebooks. That was a surprise. And because notebooks are tall, the shelf was unneeded. This is really actually a good thing, aside from wasting an otherwise good shelf. The other reason we didn’t need the extra shelf is that the top shelf of the pie safe is reduced in height by the overhang of the front of the cabinet. You can’t really use the entire height like in a regular bookcase. Just FYI in case someone else wonders about getting extra shelves. If a person had all DVD cases and small paperback books, then they could use extra shelves. That’s probably more information than you wanted. Thanks so much. It was a pleasure dealing with you.